I've been to South-East Asia three times now (not counting Singapore, though I have also been there three times, it is just that the last time I was there it was for a couple of days before heading off to Europe), or I probably should be a little more specific and indicate that two of these three times I was only in Thailand. This latest time I also visited Cambodia and Malaysia, and I also spent a lot longer than I have done on previous visits (namely because I had a bit more time to explore). Now, I have already written about my experiences in an Islamic country, though that has more to do with the cats than anything else (though there is always my travel blog). So, in this post I'm going to look at the major religion of Thailand and Cambodia - Buddhism. Actually, when I say Buddhism I should point out that there are three major strains of Buddhism: Theravada (or as I refer to it, Indian Buddhism), Mahayana (or Chinese Buddhism), and Vajrayana (or Tibetan Buddhism). The thing with Buddhism is that it isn't so much a religion, but rather a philosophy that attaches to a religion. As such, when you wander through places like Hong Kong and Macau and visit the various temples scattered about, while they are Buddhist in nature, you will also find many of the local deities present as well. In fact the various temples are generally dedicated to the various Chinese (or Tao) gods. This is similar in Thailand, except that prior to the coming of Buddhism, Thailand (and in turn Cambodia) were Hindu, and as such you will encounter many of the Hindu deities as you wander about the area. Before I continue I want to point out that what I am writing here is based more upon what I discovered as I visited a number of temples in the region and observed what was going on (and also various readings of Wikipedia to get a bit more clarification). When I first visited Hong Kong, and in turn South East Asia, I was a bit concerned about going into temples, namely because of the idea that not only am I entering a non-Christian place, but that there are suggestions that there are demonic entities present there as well. I do know some Christians from Hong Kong who won't enter any of the shrines there, but that has more to do with her having grown up in that culture as opposed to being a western tourist. I have also asked various peers as to their thoughts on the subject. One particular pastor simply brushed the whole idea off suggesting that there was nothing to worry about, and that what we are dealing with are idols that are in fact just pretty statues. However, that does raise the question of respect, because I can just picture some of these people being somewhat disrespectful to the traditions and culture of the region that they are visiting. 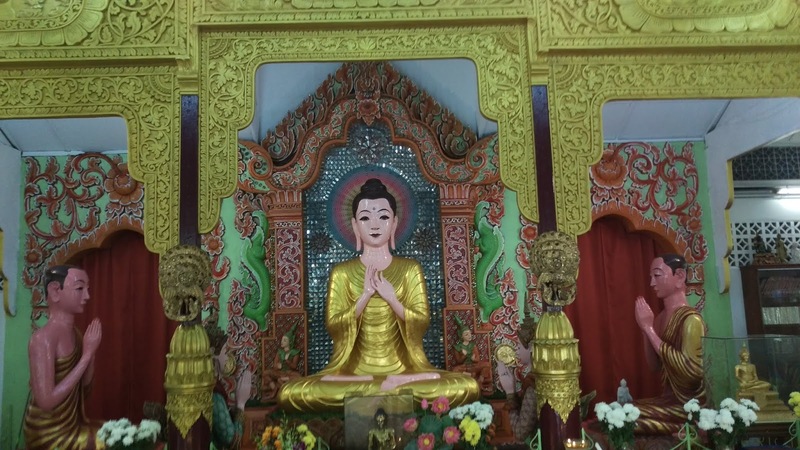 While many Christians simply view the Buddhist statues as being simply a lifeless statue, my concern is that some are likely to actively be disrespectful to the culture. So, the question rises as to respect. Where do we draw the line between worship and respect? Okay, some Christians won't enter these temples, though one I spoke to pointed out that he goes into banks and shopping centres, and in essence these places are cathedrals to the worship of money (I won't say capitalism because this goes beyond that). In fact Tim Keller points out in his book on idols (Counterfeit Gods) that not only is money a religion, but so is politics, and family. I guess in the end it comes down to where our heart lies. While I wouldn't bow before a Buddha, or burn any incense, I do think taking one's shoes off before entering the temple, remaining quiet, and respecting the traditions of the locals such as not showing your back to the Buddha, or standing over one, is not necessarily in the same category of worship. In the end the teachings of Christ are offensive enough (in that we aren't, and are never going to be, good enough to earn salvation), that we should not aggravate the situation by being another ignorant, rude, and obnoxious Westerner (and Thailand unfortunately seems to attract its fair share). One thing that I have noticed here in Australia is that for a long time the evangelical Church has been carrying on about how religions are not the same, but that has a lot to do with the secular belief that they are. To be honest, I'm not all that surprised that that is what they think because if we look at them we pretty much see the same performances dressed up in slightly different clothes. The thing is that sometimes I feel that some of these apologists are basically fighting losing battles, and in the end people don't really care about their arguments. Look my position is no, religions aren't all the same, and this goes beyond the different clothes that they wear. For instance the eastern and western religions are vastly different, namely because religions in the west are monotheistic whereas religions in the east aren't. Secondly, Western religions are focused on the idea of getting to heaven when we die, and being good enough to earn a place there, whereas Eastern religions don't have a concept of heaven that we in the west have. In fact in the east the goal is to escape the endless cycle of death and rebirth, and to basically cease to exist - that is Nirvana. As a side note, I always find in funny how we have these westerners that carry on about how wonderful reincarnation is, when in reality it is actually something to escape. The other thing is that it is amazing the number of people who claim to be queen Nefertiti (and that nobody every claims to have been a peasant, or a slave, in a past life). Then we have Christianity. Honestly, at face value, there is nothing about Christianity that sets it apart from the myriad of other religions out there. Many people simply treat it as such - they go to Church, tithe, don't do anything wrong, and pretty much behave as if when they die St Peter is going to be there, holding the pearly gates open and ushering them in. Sure, they believe in Jesus, but in the end they don't actually pay much attention to what he actually said, and simply view him as a good teacher. The thing is, at least in my mind, that this is not Christianity. The thing is that Christianity isn't about what we do, but rather what has been done. Further, Christianity isn't so much a religion, it is a relationship. Yet, when I wandered into the Buddhist temples (actually, the proper term is Pagoda, so I will use that term from now on) in South East Asia, one thing I noticed is how similar they are to the churches and Cathedrals in the West. Sure, they are built differently, but if you wander through Catholic churches not just in Europe, but throughout the world, you will notice that there are things that are very much the same. For instance, in Catholic churches there are statues of the saints, and images of Jesus. The stations of the cross are positioned around the walls, and the larger churches even have shrines dedicated to specific saints. Further, in a Buddhist temple you will see people lighting incense, and praying before the statues. Guess what, they have in the churches - yep, incense, and candles. Oh, and the prayers, you can be assured that the people in Thailand are praying for exactly the same things that people in Europe are praying for - heath and wealth. As I wandered around South East Asia I couldn't help notice that I would see Buddhist monks wandering around everywhere and it made me wonder whether they were attached to a pagoda in the way that a Christian Vicar is attached to a church, or whether they simply wander about as they wish. 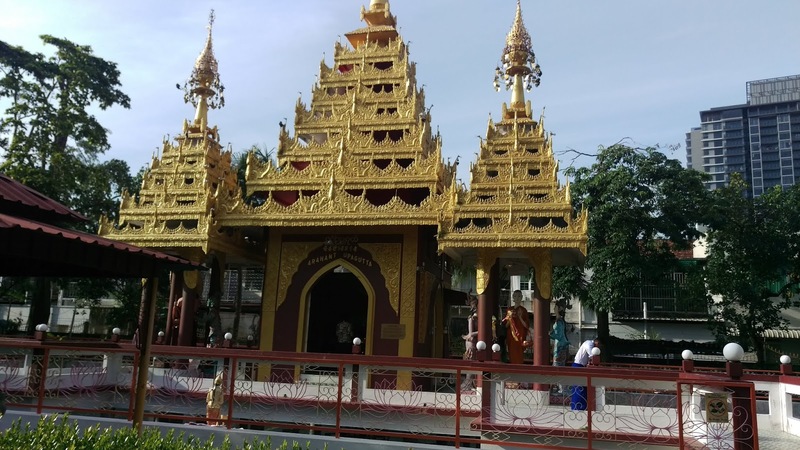 The reason that I queried that was that whenever I wandered into a pagoda the one thing that I noticed was that there didn't seem to be anybody there looking after it. Well, not quite because a few that I did enter did actually have people inside, it is just they didn't wear any religious garments, so I suspected that the people who look after the temples are probably just worshipers (which in many cases is the same when it comes to many of our Christian churches). As it turned out, after some discussions, my question was answered and yes, they do tend to be attached to a pagoda, but they don't actually live there but rather quarters in the compound. 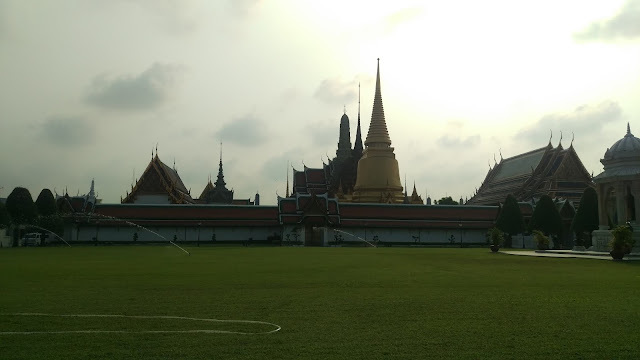 For instance the Pagoda of the Emerald Buddha in Bangkok and the Silver Pagoda in Phnom Phem don't have any monks in them, namely because they are located inside the grounds of the respective palaces. Well, when I visited the Silver Pagoda I did notice some monks wandering around, but that was more because they were invited by the royal family. Interestingly, one of the kings of Cambodia actually spent a couple of years as a monk. Anyway, the larger temples actually have quarters attached to them where the monks live. They don't actually pay to live in those quarters, but to become monks they have to be ordained - yep, as it turns out monks in Buddhism are more like priests as opposed to monks in Christianity, which is why the word monk is a little misleading. However, unlike Christianity (and Islam) there are no sermons. Rather, the monks will sit in the temple, or their quarters, and dispense wisdom to small groups and perform blessings. Mind you, they aren't supposed to have guests in their quarters, and when they do the doors have to be open - the monks live a very public life, and it is more than frowned upon for them to see people privately. Now, you are probably wandering why it is that one of the kings of Cambodia was a monk. This surprised me as well because I thought that when one becomes a Buddhist monk one becomes one for life. Well, not quite, at least not in Theravarda Buddhism. While a lot of monks do become monks for life, this is not necessarily the case here, and in fact a number of them do so for further study, and it is particularly popular for people studying doctrates. In many cases though they become monks for a couple of years to spend time studying Buddhist scriptures. Also there are also nuns, but they tend to be quite rare, at least in Thailand and Cambodia. Another interesting thing that is probably well known is the idea of the monks begging, yet when I think about it isn't that what happens in Christianity, yet for some reason we don't call it begging, we call in tithing. Okay, while tithing is supported biblically in that it frees up people for full time gospel work, sometimes I feel that maybe they are going a little bit too far, and I'm not necessarily speaking about pastors that live in multi-million dollar mansions. You see, one of my biggest concerns with tithing is that some churches seem to treat full time Christian work as being a rather cushy job. Well, there was a time when it was an incredibly cushy job, but that isn't the case these days. However, sometimes I feel that there are churches where the staff are basically living off the blood, sweat, and tears of the congregation. In fact I've noticed that some people go into Christian work simply because they cannot deal with the real world, much in the same way that academics becomes academics. Sure, the smaller churches tend to struggle quite a lot, but the larger churches will have established training courses, and people will be tapped on the shoulder and be invited to consider Christian work. The thing that gets me is that they then turn around and heap praise on how this particular person has given up a lucrative a career to serve Jesus, when in reality these people are actually paid quite well (and considering some professions, it is a lot less stressful). So, how does this relate to Buddism. Well, when we pictured Buddhist monks, we generally picture them wandering around the village and the villagers giving them food and money. Well, they wander around the city as well, or people visit the temples and leave donations. Yet for some reason we view this as begging, while we never seem to link begging with Christian gospel workers, which in the end that is what they are actually doing, yet because many of them tend to be very elegant speakers who are able to tug on our emotions, we are blinded to the reality. I was going to suggest that in Christianity some even go as far as suggesting that tithing is like investing money in the bank (well, they don't just suggest it, they outright say it), and that God's rate of return is much greater than any human financial institution could ever give us, and while they are not necessarily saying that the rewards are monetary, they know quite well that that is what their audience is thinking. However, I was then going to suggest that Buddhists give money and food to the monks (and in fact the monks get quite a lot of privileges) because it is the right thing to do, but then I realised that karma is a big thing over there, so in the end there is another similarity.